These sandals from Birkenstock retail for $94.95 and come in a variety of colors. 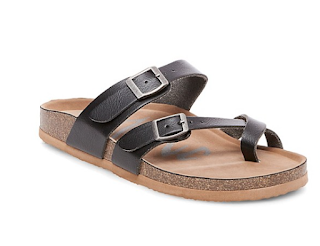 I know Birkenstock's have a cult following, but I am a bit fickle when it comes to summer sandals so I like to get a variety as affordable as possible. Target has a similar style (also available in rose gold or white) that won't break the bank at $22.99 (and they're buy one get one 50% off right now!). Click HERE to view or purchase.